That is, billing based on the value of the service and not the hours (and minutes) that went into performing a task. Like many firms, I adhered to an hourly billing model for years. It was the way of the profession. But times have changed. With advanced cloud solutions that make easy, efficient work of accounting, the hourly model is no longer sufficient. Adoption of the right technologies enables practitioners to create highly efficient systems that save significant time and open the door to substantial profit gains. So why place a limit on growth by assigning a set amount of billable hours? The time has come for CPA value pricing. Here’s a good example. I really started to appreciate the value pricing model after I began using the Intuit Online Payroll product (formerly PayCycle). The system took the pain out of a traditionally complex and time-consuming process. Processing payroll is now intuitive and fast; I can even collaborate in real-time with clients to further accelerate the process. Soon after product implementation, I was processing 20+ payroll clients in just a few hours—and ready to take on more. Hourly billing could no longer support my firm’s growth, and certainly wouldn’t yield the level of revenue possible with CPA value pricing. Advanced technologies have helped to streamline firm workflow—allowing staff to accomplish more in less time. That’s certainly what Intuit Online Payroll did for my firm—rendering hourly billing obsolete and opening the door to a much more lucrative value billing model. However, this is not a model that can simply be shoehorned in to most existing firm cultures. You must first initiate change and build the right culture within your firm to support CPA value pricing. Change can be difficult and disruptive to existing processes…but only initially. If firms plan to grow, either in size or revenue, change is a necessity. The CPA value pricing model requires updating internal systems with the right technologies and practices to support efficient, streamlined workflow processes. For many firms, that means implementing Cloud-based applications that offer 24/7 access to data, real-time collaboration with clients, and fully digital, standardized processes. Build the right system, and the value will come. Aside from elevating efficiency levels, consider also that when you standardize and define processes, you take control of workflow. You set the pace for data exchange, work when you need to work, and lead your clients in the proper direction. This enables you to better plan and forecast your workload so you are always aware where projects are in the cycle and your capacity to take on higher-billable, value-added work. Developing a highly efficient system also helps create a “client-centric” environment. Work is turned around faster, document delivery is immediate and convenient, and clients are provided with welcomed (and expected) advanced options for communicating with your firm (e.g., online portals). Clients feel the value and recognize the firm’s positive attitude about providing top-notch services at an affordable cost. It’s almost as good as a hug! Reducing busy work also alleviates a great deal of administrative stress and can be energizing. You will find that you suddenly have time to be proactive and innovative. This feeling of new found energy will motivate you to go out and seek new clients or think creatively about how to maximize consulting opportunities with existing clientele. Essentially, the growth opportunity in the accountant is reborn. All good stuff—increased productivity, immense time savings, elevated profits and growth, a new spirit and way of thinking. These are all “side effects” of creating a super efficient internal system and positive culture. These elements are also prologue to CPA value pricing. You have to build your firm to support the value pricing model, and when you do, you will experience growth and profit potential like never before. Remember, CPA value pricing is all about the value you bring to the table. You can service the client faster, provide real-time information exchange, support anytime-anywhere access, and supply clients with accurate, timely financial data, and have time left over to provide other value-added services. But before you can implement the value pricing model, you have create the environment to support it. As one of the accounting profession’s emerging thought leaders, Jody Padar’s firm New Vision CPA Group achieved next-generation status—adopting advanced technologies and best practices that support web-based client services and allow the firm to run at peak efficiency. She is an expert in green-related government incentives and tax credits to ensure clients receive the proper deductions. 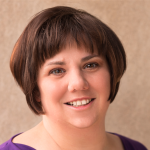 Jody is also an adjunct professor at Oakton Community College and a contributing member of the Intuit Trainer Writer Network. Jody is also a highly sought after speaker in tax and accounting. 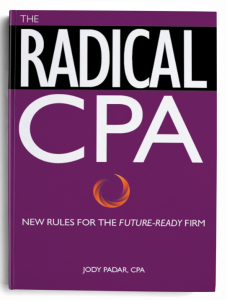 In January 2015 Jody’s long-awaited book, The Radical CPA, New Rules for the Future-Ready Firm will begin shipping in January 2015.